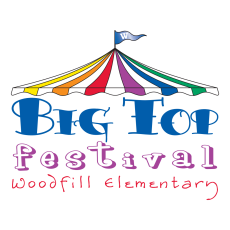 This Sunday, September 20, noon to 6pm, Fort Thomas Public School's Woodfill Elementary families, as well as the community at large, will fill the school's parking lot and first floor for the annual Big Top Festival. Formerly called The Fall Festival, this longtime tradition will feature inflatables, a silent auction, food, a cake walk, games and prizes for all ages, a basket raffle, candy wheel, body works, spiritwear, Snowie Ice Truck, and the ever-popular Up for Grabs booth. 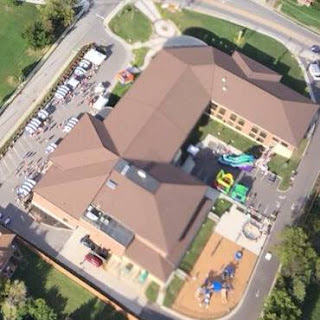 Aerial view of last year's Big Top Festival at Woodfill Elementary. Woodfill students are currently selling raffle tickets for $1 per chance. First prize is $1,000, second prize is $250 and third prize is $100. The highest seller per grade gets to douse Woodfill Principal Keith Faust with water. Proceeds from the festival are used to provide student services, such as the purchase of media and cultural arts programs, including field trips and bringing authors in for talks. Festival proceeds also support events such as Kentucky Kids Day, Red Ribbon Week and Teacher Appreciation Week (including a luncheon), and provide two $500 college scholarships to a Highlands High School senior from Woodfill each year. Also popular is the Saturday night spaghetti dinner, September 19, 4pm to 7pm in Woodfill's cafeteria. Enjoy dinner with your family, check out the basket raffles, and play some select games—with prizes! "We are so grateful for the local business support and the Woodfill families who attend the festival year after year," says Tracy Barber, Big Top Festival co-chair. "As the school's primary fundraiser, this event is key to ensuring new technology in the classrooms, and funding annual scholarships and many other projects within the school." Planning for each new festival begins almost as soon as one ends. Shannon Fox, Big Top Festival chair, as well as many other Woodfill parents regularly meet and put in many hours to ensure a successful weekend. "Being a part of the festival is one way that I can get involved and give back to the school that has given—and continues to give—so much to my children," Barber says. "All the hours of prepping is all worth it when I see how excited, not just my own kids are, but all their friends the day of the festival."